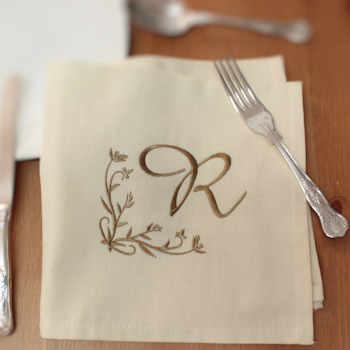 Cotton cloth table napkin in antique cream colour that can be monogrammed by embroidery with an initial and decorative corner flourish. Cotton table napkin approximately 44cm (17 inches) square. Running stitch hems and quality fabric. This cloth napkin will provide a lovely keepsake gift. Fantastic for weddings, anniversaries, christmas dinner, housewarming gifts and other special occasions.